The hood, hood ornament, grille, hubcaps, and bumpers are Modelhaus items while the fender badges and crests for the hood and trunk lid are from a Lindberg 1953 Ford Victoria kit. Harry scratchbuilt the fender skirts. The interior tub and dash are also Modelhaus resin. 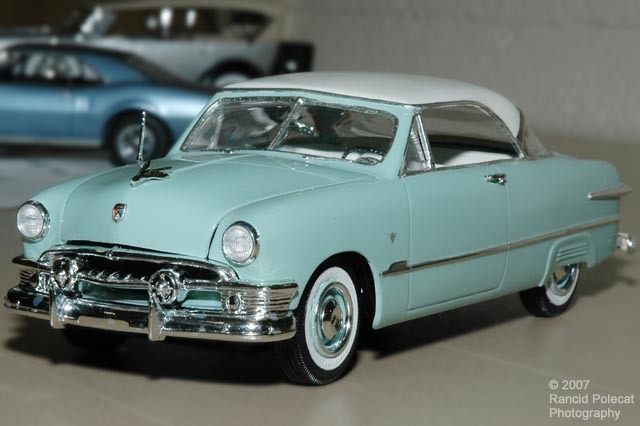 Harry used seats from an AMT 1949 Mercury kit as they had the correct pattern for a 1951 Ford. The body is coated in Krylon 3529 Catalina Mist. Dupli-Color DSGM338 White covers the top, and Krylon clear seals both colors.